The more diverse Britain becomes, the more scope there is for mainstream schools to take advantage of, and benefit from, the extensive network of supplementary schools that exists in the country. These community-led educational programmes enjoy parents’ support, and offer a personalised and informal learning environment that complements mainstream education. There are between 3,000 and 5,000 supplementary schools in Britain (Ives and Wyvill 2008), set up largely by migrant and ethnic minority communities to offer out-of-school educational programmes covering areas including the core curriculum, languages, and cultural activities. At their best, these supplementary schools offer children and young adults a rich learning experience. They provide personalised learning with strong pupil–teacher engagement. They give young people outlets to explore complex questions of identity, engage with role models from similar backgrounds, and develop networks of peer support. An estimated 80 per cent of supplementary schools teach mother-tongue languages: this helps reinforce English language learning, makes children more effective communicators, and develops problem-solving abilities and reading proficiency (Maylor et al 2010). And, as they are community- and parent-led by nature, supplementary schools also provide an avenue for parent engagement as well as community engagement more widely. In this report we recommend greater complementarity and coordination between the mainstream education system and these thriving supplementary schools. This would make some mainstream schools better prepared and equipped to deal with the pressures that come with catering for a diverse student body. It would also make these schools, as education secretary Nicky Morgan has stated, ‘fully integrated with the local community, responsive to local parents and, crucially, connected with, learning from and supporting other schools’, rather than their behaving ‘as islands, making their own way’ (Morgan 2015). We call for more mainstream schools to become more active players in their communities by engaging with supplementary schools. In doing so, they can raise the capacity of those communities, and of parents, to take ownership over their children’s education. They can help ensure that out-of-school learning and enrichment opportunities are high-quality, and open and accessible to all pupils, particularly those who need them the most. This report sets out a roadmap for how mainstream schools can build on and engage with supplementary education, where there is a high-quality local offer. We suggest three modes of engagement with supplementary schools. Greater coordination with, and referral to, supplementary schools. 1 Our research was carried out between February and June 2015. We carried out detailed qualitative research and case study visits in two London boroughs – Harrow, and Kensington and Chelsea. We chose these two boroughs due to their substantial migrant communities (both are among the six boroughs in the country with the highest percentage of foreign-born residents) and rich supplementary school provision, and because of their contrasting models of how they coordinate supplementary schools. In Harrow, the local council has been actively involved in coordinating supplementary school partnerships and development, whereas in Kensington and Chelsea the Westway Trust has served as an independent facilitator of supplementary schools in the borough, with financial support from the council. Our methods were largely qualitative, to allow us to develop a rich and detailed understanding of the history, role and influence of supplementary schools in these boroughs. This involved study visits to a variety of supplementary schools in each borough, including those teaching languages, cultural activities, and the core curriculum. These ranged from Gujurati and Eritrean schools to mixed-community schools. Some were hosted at state school premises; others were housed in community centres or dedicated spaces. Nine schools were visited in total. Semi-structured interviews were carried out with founders, teachers, teaching assistants, parents and pupils. We carried out participant observation in supplementary school classes, parents’ courses and staff meetings. IPPR researchers also observed supplementary school coordination meetings hosted by Harrow council. In addition, we carried out phone interviews with several headteachers at state schools and academies, including a mix of schools with pre-existing relationships with supplementary schools, and those without. We also interviewed representatives from local and central government, and from Ofsted. Over the course of the last two decades, the UK has become exponentially more diverse, through a combination of increased migration and broader demographic change. These changes have been felt intensely in the education system. In 2014 the proportion of ethnic minority pupils in state-funded primary schools stood at 29.5 per cent, representing an increase of more than 60 per cent over 10 years (DfE 2014). This was matched by a more than doubling of the number of ‘English as an additional language’ (EAL) pupils, from 7.6 per cent of all pupils in 1997 to 16.2 per cent in 2013 (Strand et al 2015). While in many cases the attainment of ethnic minority students remains below that of students with a white British background, the ‘attainment gap’ has been steadily closing for some groups (CoDE 2014). Students of some ethnic backgrounds outperform their white British counterparts at GCSE (DfE 2015a), including not only groups that have historically been found to over-perform (such as Chinese and Indian pupils), but also groups such as Bangladeshis that a decade ago were found to be at a severe educational disadvantage (Lymperopoulou and Parameshwaran 2014). A growing body of evidence suggests that, under the right conditions, schools with a more diverse intake benefit, overall, from that diversity (Burgess et al 2014). However, progress in terms of attaining equality of educational attainment is not uniform and cannot be taken for granted. These trends alone offer an incomplete picture of ethnic minority performance in the education system, particularly for children of migrant backgrounds. Despite the relative success of many migrant groups, educational outcomes for Somali, Turkish, and Gypsy, Roma and Traveller pupils remain well below the national average (Strand 2010). Many schools have experienced increases in numbers of pupils from these groups, and in the number of those with very complex needs – for example, due to high levels of illiteracy (ibid). The number of Roma pupils in Sheffield, for example, has increased from 100 to 2,100 within a five year period (Ofsted 2014). Ongoing humanitarian crises abroad mean that the numbers of high-need pupil groups with asylum-seeker or refugee backgrounds is likely to grow in future (asylum applications increased by 5 per cent in the year ending March 2015, and the current government has agreed to accept up to 20,000 Syrian refugees over the next five years) (Home Office 2015, Prime Minister’s Office 2015). Regardless of the outcomes of applications for refugee status, local authorities have a duty to provide full-time education for all asylum-seeking pupils aged 5–16. Projections show that there is likely to have been an average increase of 10 per cent in the number of foreign-born residents across all English regions since the 2011 census (Migration Observatory 2015). However, this increase has been far from uniform: Tyne and Wear, the East Midlands and South Yorkshire, for example, experienced more accelerated migration (with numbers increasing by 210, 129 and 124 per cent respectively) than boroughs in London (Rienzo and Vargas-Silva 2014). This means that many schools are, or will be, dealing with a more diverse intake for the first time. Areas that have relatively little experience of migration, and which like the examples above have experienced demographic change at a considerable scale, will need to adapt rapidly in order to ensure that they have the means and expertise to cater for an increasingly diverse student body. Students are also changing schools more frequently. Faster rates of population turnover have led to greater pupil mobility, which at younger ages disrupts educational progress only slightly, but in secondary school has a significant negative impact (Strand and Demie 2007, London Borough of Enfield 2008). Migrant pupils are disproportionately affected by this – as are socioeconomically disadvantaged pupils, who are twice as likely as the average pupil to move schools (Gibbons and Telhaj 2007, Cook and Singleton 2014). Recent reforms to immigration policy are likely to add to these challenges. Greater restrictions to family reunification are likely to delay the arrival of families and dependents. Consequently, migrant children will in future be more likely to enter the British education system at an older age, meaning that schools will have to find better ways to help them ‘catch up’ (Strand and Demie 2007, Heath and Kilpi-Jakonen 2012, Arnot et al 2014). Settled children living in stable households who join school in early childhood are much better placed to do well at school (Strand et al 2015, OECD 2014), so the impact of such delays could be considerable. These developments are taking place against a backdrop of significant reforms to the education system, aimed at devolving greater power and autonomy to schools. Funds to support migrant integration in the education system that were previously ringfenced, such as the ethnic minority achievement grant (EMAG), have now been mainstreamed. It remains to be seen how these reforms will impact on outcomes, but studies by the Department for Education (DfE) have demonstrated that EMAG provision led to improved attainment among ethnic minority groups (Stokes et al 2015). The pupil premium has been instituted as a means of addressing the educational disadvantages that face pupils from poorer backgrounds. Some migrant or ethnic minority pupils (including black, Pakistani, Bangladeshi, and Gypsy, Roma and Traveller groups) are more likely to be disadvantaged and eligible for free school meals and thus play a role in pupil premium allocations. While schools are encouraged and incentivised to target the pupil premium towards disadvantaged students, there are concerns about whether it is being used as well as it could be (McNally 2015). It is too early to evaluate the impact of the pupil premium on student outcomes, but recent research has raised questions about how effectively the pupil premium is being both allocated and spent (NAO 2015). Studies by IPPR and others have shown that many children from both migrant and ethnic minority backgrounds are failing to reach their full potential once they leave school (Morris 2015 forthcoming). Migrants are more likely than non-migrants to have their skills underutilised at work (Stirling 2015). The unemployment gap for those with minority ethnic backgrounds, and particularly for young people from those backgrounds, has widened significantly in recent years. In 2013, ethnic minority 16–24-year-olds had an unemployment rate of 37 per cent, up from 33 per cent in 2012, and in both cases markedly higher than the rate among this age group in the UK as a whole, which remained constant at 21 per cent in 2011, 2012 and 2013 (Brynin and Longhi 2015). Ethnic minority young people who are in work are also more likely to be paid below the living wage (ibid). So why haven’t these gaps between the labour market outcomes of young people from migrant and ethnic minority backgrounds narrowed, despite considerable progress in terms of educational outcomes? Discrimination remains a factor, but it is exacerbated by complex issues relating to confidence and identity which affect ethnic minority children. While ethnic minorities tend to have high educational and employment aspirations (Race for Opportunity 2010, Strand 2007), repeated encounters with actual and perceived labour market discrimination can lead to lower levels of self-confidence. A psychological study involving ethnic minority young people in the UK found a relationship between perceived discrimination and low self-esteem (Cassidy et al 2006). Addressing these issues will require a broad range of interventions outside the education system, including greater efforts to tackle discrimination, and ensuring that equality legislation is more consistently enforced. The education system can also play a part. However, some have raised concerns that mainstream schools and teachers are facing competing demands. The headteachers of mainstream schools whom we interviewed noted that pressures to prioritise and improve test scores on traditional and core subjects have intensified. There is evidence of a recent decline in the education system’s focus on culture and the arts, with reductions in both the number of specialist teachers (up to 11 per cent fewer arts teachers in schools) and the number of teaching hours in creative subjects between 2010 and 2013, as well as dramatic falls in the number of pupils taking GCSEs in creative subjects (Neelands et al 2015). These subjects provide important avenues for children to explore questions of identity, and to see their background valued in the context of the education system. While education reform is still underway, and the evidence remains contested, some have argued that schools are finding it harder to focus on the development of critical non-cognitive skills that have been found to be important for longer-term education and economic success – including ‘grit’, social skills, conscientiousness, persistence, self-control, optimism, and motivation (Cassen et al 2015, Leadbeater 2000, World Challenge 2015). The limitation of opportunities to develop these skills within the education system would be likely to be felt by pupils across all groups, but particularly those that are socioeconomically disadvantaged (Johnson and Kossykh 2008, Roberts 2009). While recent studies have shown that ethnic minority students tend to have higher levels of what Strand (2014) calls ‘resilience factors’ (including educational aspirations, planning for the future, and positive attitudes to schools) than White British pupils, some groups (such as black Caribbean boys) have historically been more likely to suffer behavioural, emotional or social disorders (Ball 2008). Ethnic minority children are also more likely to face the challenges associated with disadvantage, including deficiencies in social skills and networks (Barnard and Turner 2011, Johnson and Kossykh 2008), and have been found to face particular barriers in terms of accessing extracurricular activities (ACE and Iniva 2008, Parkinson and Buttrick 2014, Syed at al 2011). The supplementary schools sector can help to address many of the needs that the British education system struggles to meet as its population becomes more diverse. In the next section we set out the seven key contributions that supplementary schools make. It is important to note here that challenges relating to underperformance are not limited to ethnic minorities – recent research has also shed light on the challenges facing white working-class pupils who, on measures of economic deprivation and socioeconomic status, have a slower rate of improvement in school achievement over time than some minority groups (House of Commons Education Committee 2014). We argue that supplementary schools, while they are a tradition rooted in migrant and ethnic minority communities, can offer means of addressing the challenges facing all pupils, including white British ones. There is a long history of migrant and ethnic minority communities setting up programmes to complement mainstream education. Historically, in many cases communities set up these programmes out of a desire for their children to achieve better outcomes in a school system that they felt was failing them; in other cases, they were set up to ensure that new generations would not lose their heritage and culture. By establishing supplementary schools, ethnic minority parents (and, in many cases, whole migrant communities) are taking ownership over their children’s needs within the education system, and seeking to improve their outcomes. Their ethos is therefore complementary to government’s wider commitments to community- and parent-led approaches to education, and to greater diversity and autonomy within the schools system. In today’s Britain, supplementary schools are wide-ranging, from Gujurati, Arabic and Tamil language schools to single- or mixed-community after-school programmes that offer core curriculum support or homework help. In many cases, these institutions have evolved from their foundations as single-community schools, and now cater for children from many ethnic backgrounds. A study commissioned by the then Department for Children, Schools and Families in 2009 estimated that between 3 and 8 per cent of all pupils aged between 5 and 16 were in contact with supplementary schools – a proportion that increased to between 18 and 28 per cent of pupils from migrant and ethnic minority backgrounds (Maylor 2010). Supplementary schools differ from private tuition because they offer group-based learning, and often come at little or no cost to parents. Some are staffed by paid, and some by volunteer, teachers and teaching assistants, or by a mixture of the two. Some are run out of mainstream schools, others from community centers or dedicated spaces that they rent out. Supplementary schools also vary in terms of their success. Indeed, in the course of our research we heard of schools that held only one or two sessions before closing their doors. There are undoubtedly many supplementary schools operating under the radar, self-financing and operating without any engagement with authorities or mainstream schools. The sector is largely financed directly by parents, though some schools have been bolstered by support from a limited number of foundations, including John Lyon’s Charity, which remains the largest funder of supplementary schools in London. Much of the funding the schools receive from alternative sources, including local councils, has been scaled back in recent years. Evaluations of supplementary schools are largely favourable. A 2008 study of three such schools in Barnet found that its students achieved results in key tests that were better than local averages (Evans 2008). Likewise, surveys have consistently found that children attending supplementary schools, and their parents, think that they help with mainstream schoolwork, enable children to benefit from greater parental engagement, and have a positive impact on student motivation (Maylor 2010). One recent study notes that while a strong correlation with attainment cannot be concluded, supplementary schools build confidence, wellbeing, and other characteristics important to a child’s education (Evans and Gillan-Thomas 2015). However, there are many limitations to the studies of supplementary schools published thus far. Randomised controlled trials of supplementary schools are difficult because they are so diverse in their natures, intakes and practices. It is also hard to establish causality – parents who are prepared to give up time to attend and help out at school every Saturday are also likely to be driven and engaged in all aspects of their children’s education (Bastiani 2000, Chowdry et al 2009, Strand 2007). We therefore cannot conclude that attendance of a supplementary school in and of itself improves attainment. In conducting fieldwork and visits to some of the most successful supplementary schools in London, we found that they shared a number of qualities. Supplementary schools have strong community buy-in, and fill significant gaps in mainstream education. The most successful supplementary schools offer (in addition to core curriculum) dance, theatre, music and sport classes. They are vibrant institutions, places where young people ‘feel at home’ and ‘can’t wait to come back the next week’. In this report we identify seven key facets of the work that supplementary schools perform that have the potential to reduce the pressures that diverse mainstream schools face. Community mediation and social integration. Some studies, including one conducted by the Education Endowment Foundation (EEF), have demonstrated a correlation between successful schools and the amount of time that pupils spend actively learning, despite scarce evidence from the UK (Barber et al 1997, Strand 2007, EEF 2015). Researchers have looked at both additional study support provided through the medium of homework clubs and extra tuition (‘curriculum extension’) and at non-academic activities such as music or dance (‘curriculum enrichment’). Curriculum extension is associated with improved attainment, including among ethnic minority students (Strand 2007); it has been found to reinforce positive attitudes towards learning and encourage improved behaviour (Chowdry et al 2009), and can help children function better in the classroom and lower the risk of antisocial behaviour. Curriculum enrichment has also been found to offer benefits, having a positive impact on attainment and career prospects (Sutton Trust 2014). Supplementary schools offer both curriculum extension and enrichment. Research has shown that these kinds of programmes are more likely to have a positive impact when delivered outside the usual classroom or school setting, and with different peer groups. Learning outside the classroom has been found to help engage students by making subjects more interesting (Ofsted 2008). It can also help combat underachievement by contributing to students’ personal, social and emotional development (ibid). In most cases, supplementary schools bring together pupils from a wide range of schools. This means that they are not replicating children’s weekday classroom experience, and so give children opportunities to interact with wider peer networks across age groups, thus enabling them to enhance their social skills (Tymms and Merrell 2015). They can also contribute to the spreading of ‘good behaviour’ and discipline from one school to another through their pupils (Snyder et al 2010). Supplementary schools tend to offer a learning environment that is more relaxed, and which has smaller pupil-teacher ratios, than mainstream schools. The majority (82 per cent) of supplementary school classes contain 20 children or fewer, so they offer a significant opportunity for far more targeted and personalised education than children may be experiencing in mainstream schools (Maylor 2010). The supplementary schools that we visited in the course of this research incorporated pupils’ cultures into their approach to the core curriculum – for example, basing maths instruction around the flags of the pupils’ countries of origin. The intention behind such approaches is, in the words of one teacher, to make the pupils ‘feel comfortable in their own skin. Everyone here is invited to be proud of their backgrounds and where they come from’. Consultations with parents, supplementary school teachers and pupils repeatedly indicate that giving children access to knowledge about their backgrounds can have a powerful influence on building their confidence and self-worth, which in turns feeds back into their performance in the classroom. Work by sociologists such as Madeleine Arnot has identified correlations between a strong sense of belonging and educational attainment (Pinson et al 2010). Her work echoes the findings of studies in the US which have shown how children who learn about their cultures of origin have stronger analytical skills and tend to be more assertive than those who do not (Murphy 2009). Supplementary schools offer children with migrant backgrounds the opportunity to develop a strong sense of identity. For many, a supplementary school will be the only venue in which this learning can take place. For example, teachers at one Gujurati school in London that we visited noted that many pupils did not speak Gujurati at home. The Gujurati school was thus an opportunity to learn a language that might otherwise be lost, and that will enable children to, for instance, communicate with their grandparents. Bilingualism is a valuable asset in the globalised economy. The Department for Business, Innovation and Skills has estimated that a national deficiency in foreign language skills has cost the UK around 3.5 per cent of its GDP (Foreman-Peck and Wang 2014). Yet bilingualism remains undervalued in the UK. Learning a second language remains a requirement at key stage 2, but schools are struggling to meet demands with high-quality teachers across a range of languages. Earlier this year, for example, two exam boards – Oxford, Cambridge and RSA (OCR) and AQA – announced plans to drop modern community languages, including Polish, Punjabi, Bengali, Gujurati, Turkish, Persian, Portuguese, Dutch, and modern Hebrew – many of which are spoken by some of the largest migrant groups in the UK. Though the government subsequently stepped in to reverse these changes, questions remain about the sustainability of courses in these languages in mainstream schools beyond 2018 (DfE 2015b). An estimated 80 per cent of supplementary schools teach mother-tongue languages (Maylor et al 2010). Studies have demonstrated how fluency in a mother-tongue is one of the preconditions for effective learning of English, and improves outcomes in education more broadly. Students who have a sound knowledge of the rules of syntax and grammar are able to apply these skills to learning new languages (Cook and Singleton 2014). Studies of Spanish speakers in the US have also shown that children learning both Spanish and English in parallel tend to make greater progress in English (Lugo-Neris 2010). In short, mother-tongue language tuition in the context of supplementary schools should complement and reinforce English teaching in mainstream schools, and may also support broader learning. Beyond mother-tongue proficiency, bilingual children have been shown to be more effective communicators, to possess more advanced problem-solving abilities, and to have the ability to use a wider range of reading strategies (Cook and Singleton 2014). Many of the pupils who attend supplementary schools (and their parents) that we spoke to noted that they were often the only settings in which pupils interacted with teachers and high-achieving peers from the same background. This is important, because the English teaching profession is not yet representative of the population that it serves. Only 2.4 per cent of headteachers are from an ethnic minority background while, as of January 2014, 29.5 per cent of pupils in state-funded primary schools were from an ethnic minority background, as were 25.3 per cent of pupils in state-funded secondary schools (DfE 2015c, 2014). Studies have suggested that migrant children in particular often learn better in contexts in which they feel represented. Peer-learning between children who share a migrant background has been found to have a significant impact on attainment (OECD 2014). Supplementary schools are, by and large, parent-led initiatives, and so by their nature respond directly to parents’ aspirations. Where they are set up by migrant communities, supplementary schools can help overcome the barriers that prevent migrant parents from engaging in their children’s education (Maylor et al 2010). Parents from migrant backgrounds are less likely to get involved in mainstream schools because of language and cultural barriers, and because of other commitments such as non-traditional working hours or less flexible schedules (Goodall and Vorhaus 2011, OECD 2010). Many supplementary schools were founded by, or are staffed by, parents, and offer a space in which parents feel comfortable engaging with education. They are an important interlocutor between migrant parents and mainstream schools – supplementary school staff often accompany parents to school meetings, or help manage complex situations which may be exacerbated by the language barriers that some parents face (Kenner and Ruby 2013). Many supplementary schools play a wider function in the community than education alone. They can act as a critical first port of call for newly arrived migrants and their families. In addition to providing support, they can also perform a ‘signposting’ function, helping newcomers to access practical information and allowing them to gain some understanding of the codes that govern British public services – particularly the quirks of our education system. Nothing illustrates this dual function better than the fact that many supplementary schools also provide English language classes that parents can attend while their children learn their mother tongue. Such provision has become even more critical over the past five years, as many of the services targeting newly arrived migrants have faced considerable cuts. Supplementary schools also facilitate critical dialogue between mainstream service-providers and migrant groups. The headteachers whom we spoke to saw the supplementary school sector as a source of critical cultural intelligence that could be tapped in to in order to inform policies and practices in the classroom. We also heard that supplementary schools had stepped in to help resolve disputes on issues such as sexual education, and to develop greater liaison between parents and schools. Many institutions that initially served single communities have, in time, incorporated students from all backgrounds. Schooling is both a heartfelt, galvanising issue, and one that provides significant scope for building common cause between parents across communities. Supplementary schools are perhaps the greatest example of the mobilisation of civil society — communities taking ownership in order to overcome social challenges and provide a better future for their children. 2 Some supplementary schools may also offer faith-based programmes and/or religious instruction, but this report focusses on the substantial proportion of supplementary schools that do not provide any religious education. 3 For IPPR research on religious supplementary education see Cherti M (2011) Inside madrassas: Understanding and engaging with British-Muslim faith supplementary schools, IPPR. The benefits of ‘out-of-school learning’ and extracurriculars have long been recognised (DfE 2013, Paterson et al 2014). There has been debate over the merits of widening the offer of schools themselves. One such proposal is for ‘full-service schooling’ – the concept of schools integrating education, medical, social and human services on school premises. This has become reality both in Northern Ireland – where over £10 million in dedicated funding went towards such services in 2015/16 – and, through the New Community Schools Initiative, in Scotland. Other proposals have involved extending the academic day to as long as 10 hours, and extending the academic week into Saturday, both of which were proposed in 2014 by the then education secretary Michael Gove (Gove 2014). While there is some evidence to suggest that extending school hours can boost outcomes, it poses many challenges. According to EEF, simply extending the school day can be a moderately expensive option (EEF 2015). Research has also indicated that this option is most effective when it can offer targeted support for pupils at risk of low attainment (Fashola 2013). In our own interviews with stakeholders in supplementary schools, the voluntary nature of supplementary education was repeatedly highlighted as key to its success – families, and indeed children, chose to be there on evenings and weekends. Choice can make the difference in terms of reaping the benefits of extended learning and enrichment. Supplementary schools therefore offer a less intrusive alternative to wholesale extension of the school day. They also offer a less costly and more widely accessible option than other education ‘top ups’ such as private tuition, demand for which has increased in recent years – in 2009, 40 per cent of young people in London reported having had private tuition (Sutton Trust 2014). Though this is a trend that remains concentrated within the richest quintile of households (ibid), recent investigations have noted increasing demand from low-income parents as well, and those from ethnic minority backgrounds in particular. Nevertheless, private tuition is by nature reserved for pupils whose parents take an active interest in education ‘top ups’, and are able to invest in doing so. As a result of reforms introduced by the previous, Coalition government, schools today hold greater power to determine their curriculum beyond core subjects,4 and some schools have done exceptionally well in terms of prioritising extracurriculars – pairing pupils with instruments, encouraging theatre, and offering cultural trips (Birdwell et al 2015). However, teachers are coming under greater pressure to maintain their schools’ ratings in performance tables and Ofsted reviews, which may impact upon their commitment to developing programmes beyond the core subjects (Board and Tinsley 2015). For example, following the introduction of compulsory modern or ancient foreign language teaching at key stage 2 in 2014, although 99 per cent of primary schools in one study taught a language, only 17 per cent invested in extra training for teachers and only 6 per cent recruited new staff. Thirty-one per cent of primary schools employed no staff with more than one GCSE in a language (Board and Tinsley 2015). In this report we argue that supplementary education offers a way forward for schools and teachers facing the multiple pressures associated with increased diversity, and with competing demands within the education system. There is a compelling argument for some mainstream schools to take greater advantage of supplementary schools, which have already been set up and endorsed by parents, and which offer personalised and informal learning environments and extracurriculars that compliment mainstream education. Working with supplementary schools is a stronger approach than simply expanding schools’ hours and remits, for four reasons. First, it is cost-effective. Working with supplementary schools builds on pre-existing programmes that already have parent buy-in and, in many cases, pre-existing financial support, and capitalises on networks of volunteers. In return, schools can offer access to facilities, high-quality teaching, quality assurance, and recognition. Second, it is more likely to get parents through the door, and can be particularly helpful as part of efforts to engage newly arrived migrant parents. Supplementary schools can help build bridges, provide interpretation, and make parents more aware of the practices of the British education system. Third, beyond the impact it has on individual students, it can also deepen a mainstream school’s roots in the community, by actively supporting community initiatives to improve outcomes and opportunities for local children. Finally, it helps prevent isolation. There are risks associated with overlooking supplementary schools. Irrespective of future policies, supplementary schools are likely to continue operating. Where supplementary schools have no relationship with mainstream schools, their teaching of the core curriculum may not be aligned with the mainstream curriculum and – if provision is poor – could risk undermining what is being taught at school. Encouraging and empowering those supplementary schools with a high quality offer will lessen opportunities for supplementary schools with lower standards, and so offer mainstream schools greater control over their pupils’ learning and progression. 4 That is, English, maths and science – the three subjects that are compulsory at all four key stages. We suggest three modes of engagement with supplementary schools. Schools can start by establishing a firm understanding of the uptake of supplementary education in their areas, through a simple mapping exercise or survey. Once it has identified them, mainstream schools should learn more about the supplementary schools that are catering to their student body, to get a sense of what they are providing and its quality. Supplementary schools do vary greatly in quality. Mainstream schools can make use of information provided by the National Resource Centre for Supplementary Education (NRCSE) to assess the quality of provision (see the box below). Mainstream schools may also contact their local authority to seek advice about supplementary schools in the borough, as some local authorities coordinate and keep records on the supplementary school sector. Our research identified Harrow council as exceptional in its coordination of supplementary schools through the Harrow Supplementary School Forum, which was set up in partnership with John Lyon’s Charity and aims to coordinate and collectively raise standards in supplementary schools across the borough. However, it is worth noting that in those exceptional cases where local authorities do undertake such coordination, we found that these efforts are in decline due to budget constraints. John Lyon’s Charity has helped establish and fund eight borough supplementary school forums in North West London. The NRCSE was founded with support from the DfE, is run as an independent charity, and offers accreditation for supplementary schools. The NRCSE establishes minimum standards and aims to improve quality across the sector, through a three-tier voluntary quality recognition scheme (bronze, silver and gold). Only 18 per cent of the over 2,500 schools logged by NRCSE are members of the organisation, and only 7 per cent are accredited. However, the code of practice that the NRCSE launched in 2007 had been signed by 1,300 supplementary schools as of 2013 (London Funders 2013). This code of practice covers the following 10 areas of delivery in the provision of supplementary education. The NRCSE’s silver and gold awards recognise standards in teaching and learning, partnership, governance and management. Each year six gold award schools are put forward by a quality framework mentor provided by the NRCSE to join a ‘recognition meeting’ to peer-assess two or three other supplementary schools to prepare for a special distinction award. This special distinction award is on offer to schools that are working with other supplementary schools to disseminate good practice. Where mainstream schools are confident that the supplementary schools in their local area represent a good offer, they can informally signpost parents towards them. Some schools have implemented more coordinated referral programmes that refer pupils who would benefit from extra-hours support to the best local supplementary schools (the Stag Lane Junior School and Norbury School, both in Harrow, are two examples – see the box below). Mainstream schools can also share their premises and facilities with supplementary schools. We recommend that mainstream schools offer them as in-kind contributions, or at subsidised or discounted rates, recognising that supplementary schools are community-run non-profit organisations. We recommend ensuring that a school site manager is present whenever supplementary school’s activities are taking place. Where supplementary schools offer core curriculum support, mainstream schools can engage in curriculum-sharing with supplementary schools, to ensure greater complementarity between the curricula of both schools. This can extend to mainstream schools providing materials and guidance on out-of-school curricula, for instance; they can also offer training on the mainstream curriculum for supplementary school teachers and volunteers. Furthermore, mainstream schools might choose to ‘pair’ teachers with local supplementary schools, thereby ensuring that paid, highly able and trained teachers are teaching in supplementary schools. Mainstream schools, particularly where they referring pupils, can share data with supplementary schools in order to monitor pupils’ attendance and track their progress. While the results of this monitoring would not be as robust as randomised controlled trials – which are challenging to conduct in education (Cassen et al 2015) – they would help both mainstream and supplementary schools to assess their impact. The Norbury School, Stag Lane Junior School and Whitefield School have partnered with Afghan Association Paiwand to host three Saturday schools catering to pupils of all backgrounds. The programme partners with 16 ‘feeder’ schools to refer approximately 300 pupils to the three Saturday schools. For referrals from the mainstream schools, fees are paid by the schools at a discounted rate, rather than by parents. In terms of staffing, the Norbury Saturday School, for instance, includes five UK-qualified teachers, three community teachers, and five volunteers. Each school’s programme offers core curriculum (English and maths) and arts (music and drama) activities, followed by Dari and Pashto lessons for those who choose to continue in the afternoon. These three Saturday schools cater to 500 children in total, aged between 6 and 16 years old and from all ethnic backgrounds, although approximately 40 per cent of the pupils are from an Afghan background. The total annual cost of running these three supplementary schools is £115,000. Partner schools pay £150 per pupil per annum for those that they refer to the Saturday school. Where mainstream schools are confident that there is an excellent offer of supplementary schools in their local area, they can bring supplementary schools into their programming in a more substantive way. Mainstream schools and supplementary schools can agree to share services. In return for use of a mainstream school’s premises or another service, supplementary schools can work within mainstream schools to address the pressures that they face due to increased migration and diversity. For example, the Shpresa Programme,5 a supplementary school in Plaistow, east London, led by the Albanian-speaking community, offers mainstream schools in-school support with Albanian pupils who have specific needs. Paiwand,6 a supplementary school working with Afghan pupils in Harrow, works in mainstream schools that have high intakes of Afghan children (see the boxed text below for more details about both schools’ work). Schools that face particular challenges in terms of fulfilling compulsory modern or ancient foreign language teaching at key stage 2 can turn to supplementary schools to provide teachers and advise on curriculum development. There are some successful examples of this: Hua Hsia Chinese School in Barnet offers Chinese language classes and cultural activities in mainstream schools, reaching both pupils with Chinese heritage and those from other backgrounds (Paul Hamlyn Foundation 2015a). Similarly, a programme linking supplementary schools with mainstream schools to help bilingual children gain qualifications in their home language has met with particular success in Sheffield (ALL 2015). In exchange for this provision, mainstream schools can share their premises with supplementary schools at no cost, share teachers (that is, offering paid teachers to teach in the supplementary school), or offer other resources. Shpresa was set up in 2002 by a group of Albanian mothers to promote the participation and integration of the Albanian-speaking community in the UK. The programme serves more than 450 pupils across eight London boroughs (Newham, Hammersmith and Fulham, Barnet, Haringey, Enfield, Redbridge, Barking and Dagenham, and Kensington and Chelsea). Shpresa partners with mainstream schools in each borough, which offer their space and caretaker services free of charge in return for free Albanian interpreting services for parents’ evenings in schools with large Albanian-speaking communities. There are 37,680 Afghan nationals living in the UK, and the majority live in London. Afghan Association Paiwand is a supplementary school founded in 2002 and based in Harrow, north London. Paiwand was formed to unite the Afghan refugee community and give Afghan children an opportunity to maintain their home language and cultural identity in the UK. Whitefield School, a mainstream school in nearby Barnet, has a student body made up of approximately 75 per cent ethnic minority pupils, around one in seven of whom have an Afghan background. In 2005, Paiwand and Whitefield School launched a new partnership. Whitefield offered Paiwand access to 10 classrooms and other facilities (sports and theatre spaces) every Saturday during term time. In return, Paiwand offered the school a community teacher to be based within Whitefield’s EAL department for two days per week, to offer bilingual support. This support included personalised support for newly arrived migrant children, classroom assistance, outreach to Afghan parents regarding their children’s performance in school, and the translation of school information for parents into Dari and Pashto. In 2009, Paiwand opened its services to other ethnic minority groups, and subsequently revised its aims so that its mission is now to work ‘for the benefit of Afghans, refugees and migrants in the European Union’. The organisation today works with 3,000 young people and adults. Mainstream schools can also opt to set up Saturday programmes. While some mainstream schools have opted to do this on their own, we believe that it is most effective (and cost-effective) to do this by collaborating with existing supplementary schools that already cater to local families. As they develop programming in cooperation with supplementary schools, mainstream schools should pursue the following objectives. Expand the reach of supplementary schools’ offer to a wider range of students, offering, for example, Gujurati or Polish classes to children of different backgrounds. The benefits of learning languages are widely accepted, and encouraging more pupils (beyond those who are already bilingual) to take advantage of opportunities to learn community languages will help prepare those pupils for education and life in both modern Britain and the global community. Engage parents in substantial ways – encourage parents to join as volunteers (which has the knock-on effect of contributing to a more diverse pool of staff and role models), or offer activities for parents, such as EAL classes. 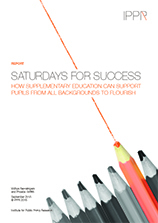 This report recommends several ways in which mainstream schools can benefit from the work that supplementary schools do – beginning with a simple exercise to ascertain the uptake of supplementary education across their student body. Once mainstream schools are aware of the local provision of supplementary education, there are several tiers of engagement that they can pursue – including signposting for parents and referral programmes, hiring supplementary school staff to address pressures within schools, exchanging services such as teachers and premises, and setting up Saturday programmes in partnership with local supplementary schools. The nature of mainstream schools’ engagement with supplementary schools should be based on the quality of the local offer. Mainstream schools can benefit from the kinds of rich, extracurricular learning environments that supplementary schools offer, becoming better equipped to deal with the pressures that come with increasing diversity. Doing so will also enable mainstream schools to develop stronger roots within the communities they serve, and get parents through the door and involved in school life in more substantial ways. It will also help them to improve and widen their extracurricular provisions (which are evaluated by Ofsted), thereby addressing calls from political and business leaders for schools to become more than mere ‘exam factories’. More and better partnerships between mainstream and supplementary schools will ensure that the benefits of the best of these programmes reach communities that are least able to access supplementary schools, but whose children may need them the most. Supplementary schools are currently less accessible to white British pupils, and to pupils from Gypsy, Roma and Traveller communities, than to pupils from other backgrounds, as both groups lack a history of community-initiated supplementary education.10 The referral system developed by the Norbury, Stag Lane and Whitefield Saturday Schools offers a model for how mainstream schools can widen the reach of supplementary education. These kinds of partnerships will contribute to ensuring quality control and high standards in supplementary education, and will strengthen the role of mainstream schools as key players in the community. Pinson H, Arnot M and Candappa M (2010) Education, Asylum and the ‘Non-Citizen’ child: the politics of compassion and belonging, Routledge. World Challenge (2015) Giving You the Edge: What is the real value of the extracurricular experience in the university application process?